The Outreach Ministry of SJMBC and the FCC would like to invite you and your children to participate in our S.A.S., After School Program. 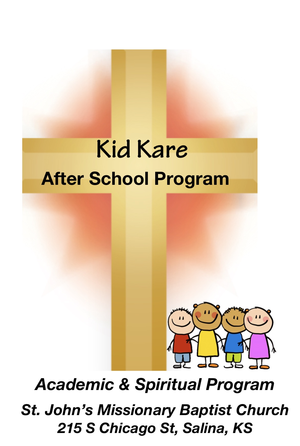 The mission of the S.A.S., After School Program is to provide a safe, enriching and supervised place for youth to fellowship, learn life skills anod have fun. S.A.S. represents the Social, Academic and Spiritually led areas that the program is based on. This is a joint community outreach effort by St. John’s Missionary Baptist Church and First Covenant Church. The program will include a meal, recreation and on-site field trips and activities that would help to enrich and encourage participants. The program runs from 3:30 – 5:30 pm on Tuesdays and Fridays. Tutoring and Life Skills will be taught on Tuesdays. Friday is reserved for fun! If there is no school for USD 305, there will be no after school program (that includes any inclement weather days). We look forward to having the opportunity to minister to your child.